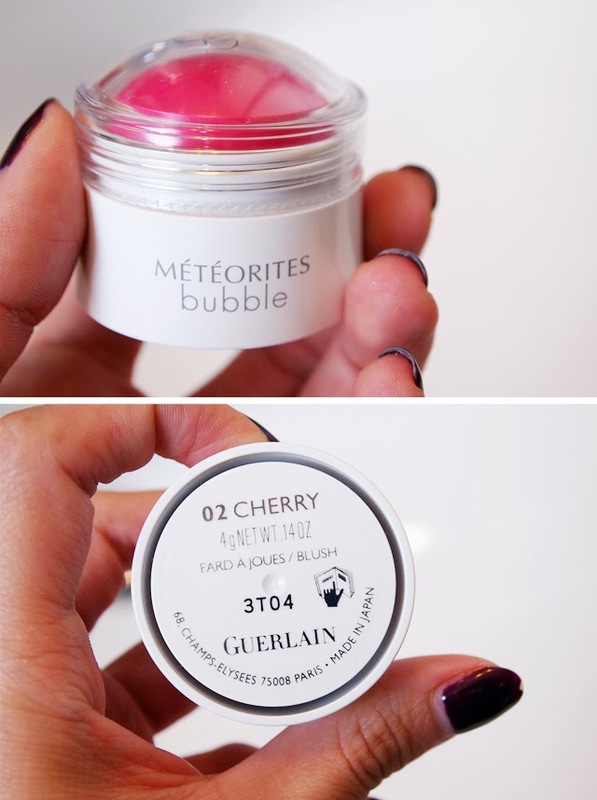 But to be a little less macabre, I'm going to blog about this very new and fascinating blush just issued from Guerlain not tooooo long ago (probably much earlier in the States though), and just how much I love it. It was a Valentines present from my beloved friend, Abu, because we had a Secret Valentines going on within our clique - juuuuuuuust in case you were wondering, hehe. I was going to take the brief introduction from Guerlain's official page.. but it seems that not much information is given there, so I'll try my best to do the brand some justice here. 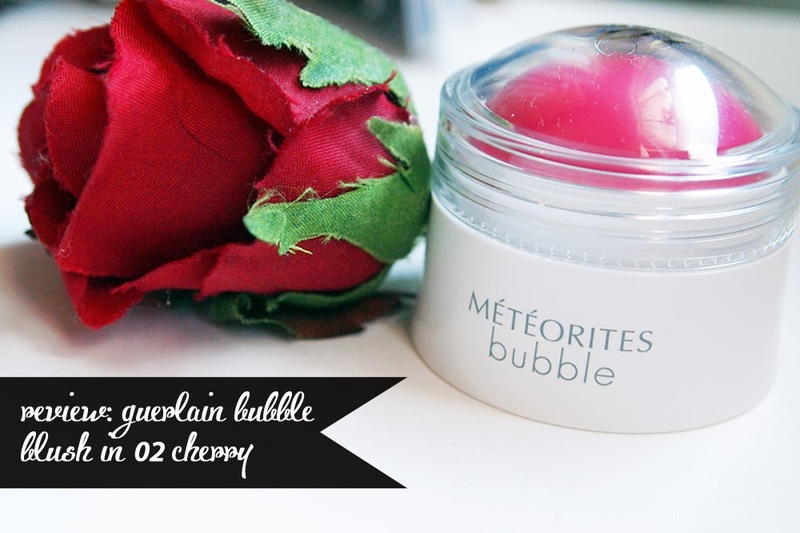 Aptly called the Bubble Blush, the product itself is round and is kept within this nice bubbly packaging. Though encased in a plastic cover and base, both look sturdy enough to be brought out anywhere and (dare I say it?) even able to survive a few drops now and then. A few people seem to have some issues with the packaging, saying that it looks cheaper and not as luxurious as the Meteorites, but I've personally no problems because I can bring it out wherever without worrying I'd damage the packaging. The blush itself kind of reminds me of those roll-on sunblocks I once used when I was young! Any of you guys remember those? Anyway, the Bubble Blush is described as a "Light Cream" that gives a "Fizzy Healthy Glow" and ends with the most beautiful satin finish. There are two colors for this: #01 Pink and #02 Cherry. The Pink is a little more light and dainty, very suitable for fair to very fair skin tones. Cherry is more of a Fuschia, which may look bright on the outside but blends out to a healthy flush, and seems to be more suitable for slightly darker skin tones. I decided to get the Cherry shade because I'm not that fair, kind of an in-between, and I do tan easily especially when I go overseas; hence I thought a darker color would be a safer choice. 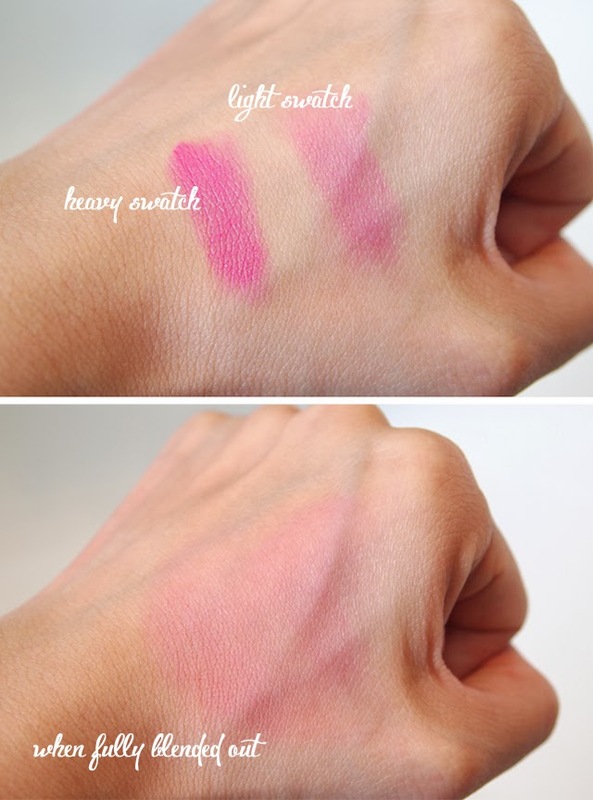 Above are the swatches, both light and heavy; also, a picture of what it looks like blended out. The swatches were applied straight from the "bubble" onto my hand. The color payoff still looks rather intimidating and very strong. However, you don't need to worry at all because it blends out like a dream! I was so shocked when I just used my index finger to even out the swatches, and they just MELTED (!!!) into my skin, leaving only a nice powdery texture behind. The bright fuschia was now a healthy flush of pink that was not over the top at all! In fact, if you're looking to mimic that "after-exercise" glow, I think you'll find it in this perfect little bottle. If you seek a stronger color, no problem, just go ahead and layer it up. I'm using two different methods here. One will be with buffed in with a brush, specifically Lovebelle Eclipse Range's Angled Blusher Brush (so soft and luxurious by the way!) and with my fingers. How I apply it is by drawing in some short strokes of the blush on each side and then proceed to blend it in with quick stippling motions in an upwards fashion. On my right, you can see how it works out with the brush, and on my left is with my fingers. I really think both work out well because the blush is as soft as mousse! If you reallllllyyyyyy want me to nit-pick, however, a brush will work out better because it has better control over the area you want it blended in. I find that fingers can sometimes end up tapping too far front or high on the cheeks and you can end up looking sunburnt instead. I have combination skin with dry cheeks, so naturally this kind of stays on better for me. It doesn't slip, it doesn't slide, it doesn't budge. It leaves the most beautiful stain through the day and only ever so lightly fades away (what a pretty rhyme lol). The sales assistant at Guerlain did promise me though that this still works on oily skin types due to its cream-to-powder consistency, and does not/will not disappear as quickly as others do! He did assure me that it will DEFINITELY work as well either way... but I'm having a little trouble believing that to be honest. I suppose if it works 100% well on normal skin types, those with oilier skin might find that it performs 80%. It will still be better for you to go down to the counter and try it on personally - wear it on through the day and then make your decision! Is it clear yet that I'm in love? So suiting, considering that this was for my Valentine's, hehe. If it isn't too obvious above it's because I blended it out to be as natural as possible! You can definitely pack on the color to any extent you'd like. I really like everything about this. From the portability to ease of application, to how easy it is to blend and how pretty the final look is... it's just an A+ in my books. Definitely, definitely. I think the picture above even shows how happy I am, lol. Because I am happy! It's the holidays!!!!! We have an exciting event to attend this Friday, so this will definitely make a star appearance!